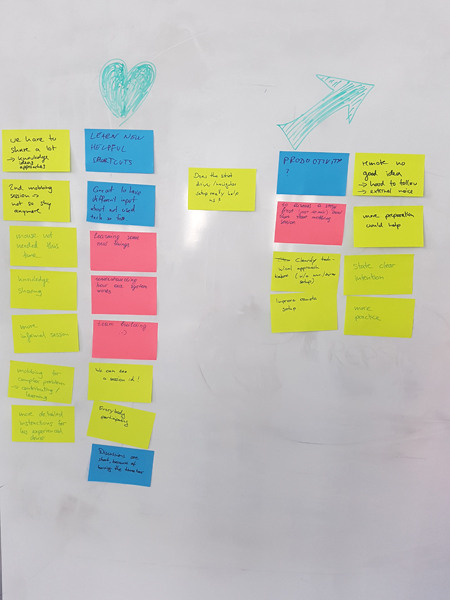 Two days ago, my team had quite a tough retrospective, openly addressing the issues we have in the team. Mobbing was named as one approach to improve knowledge sharing as well as challenging potential implementations. So we decided to mob again on the next day. In addition to the feedback on our first mobbing session, there was a strong wish to do things in a more informal way, more spontaneously, and with a more dynamic mob size. We decided not to book a separate meeting room but use our office, since we have our own big TV screen and quite some space upfront. We figured if this would work, we could mob way more spontaneously. We share our office with another team, so we wondered whether mobbing would disturb them more than other discussions we normally have in the team. We decided to "not ask for permission, rather for forgiveness" and just try it. And it worked out pretty well. One of our longtime working students just started working full-time. Since he missed our first mobbing session, I provided a short introduction to the key concepts, emphasizing the rule that you're valuable in the mob if you are either contributing or learning. This time we picked a large, complex story introducing new technology into our product. We considered it crucial to have the new knowledge shared with everybody as soon as possible. According to the feedback from our first mobbing session, we decided on a longer and not so strict rotation. We set the timer to six minutes. When the alarm set off, we had the navigator finish what he wanted to do, and only then rotate. This rather event-triggered approach was really well received. This time we had one team member working from home office, so he could only join remotely. As we don't have a technical solution to grant control, but only can share our screens, he could not become the driver. 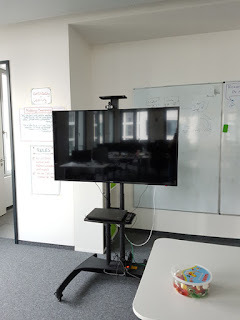 The mob had the impression that our remote team member felt left out, and he himself confirmed that the technical setup did not work well remotely. After a two hour session, we finished with a short retrospective what we liked and what we longed for. Again the team loved the knowledge sharing aspects, the learning, the different approaches, the collaboration, the team building. Even though we had yet another developer laptop with yet another keyboard layout and no mouse available, it worked really well. People were a lot more willing to adapt to the unused layout. And the best thing was that when finishing mobbing for lunch time, we had a working increment! On the other hand, some doubts were raised whether the driver / navigator pattern really helped us or rather held us back. Productivity was again questioned. Also, we longed for more preparation and discussion upfront before actually starting with the implementation. Still, the team agreed to continue mobbing on the story as we introduced new technology here and it was important that everybody on the team shared the knowledge. We agreed to try an even less formal approach for the next session, without strong navigator / driver roles and instead rather have everybody contribute on the fly. Last but not least, we also agreed to try a more dynamic mob size, with people being allowed to leave (like for personal meetings) or join anytime. Today, we gathered around our TV again. This time all co-located. Still, we had a team member in the mob who missed the last session, so we started by getting him on board what the story is about and how far we got. Then we continued with a short discussion on the open things to do, potential solutions, and agreed on the next step. We had everyone on the mob, being allowed to contribute, even the one on the keyboard. We did not use a timer anymore, but still rotated the one at the keyboard about every fifteen minutes. We had a third developer laptop with yet another keyboard layout and even operating system - and again, it was not much of a problem anymore. We also had the case that one developer left for a meeting and afterwards rejoined the mob. It didn't cause any issue. I had to leave for a conference call in the middle of the session myself. After two hours, the team came to a point where they got blocked by another story currently in development, so they decided to stop. We didn't do a formal retrospective anymore, just asking around for opinions. We found that we really like this pretty informal approach, still with only one laptop, but with everyone contributing. We liked that the mob still rotated the one at the keyboard from time to time. We loved that everybody could speak up and contribute ideas. We loved even more that this session was received way more productive. All agreed they were happy with this format! The team wanted to give mobbing a try at least three times to find out how this approach might help us. Well, we've done three sessions by now, so our initial objective is accomplished. Originally, I wanted to keep the strict format for a longer period. However, I feared that the team would reject mobbing itself then, so now I'm really glad that we instantly adapted and tried a more informal way. I'm also glad this worked out with everybody still speaking up and being heard. As they liked this informal approach, I now see the chance that the team will not only include mobbing in their toolbox, but also make use of this tool, at least from time to time. I'm curious if a trigger will still be needed to break old habits and remind ourselves of this option. But I would love to see that happen.